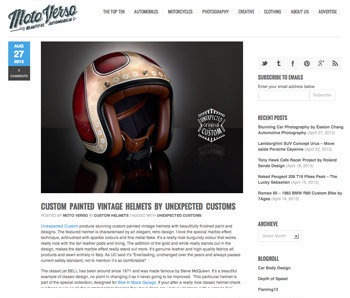 Unexpected Custom produce stunning custom painted vintage helmets with beautifully finished paint and designs. The featured helmet is characterised by an elegant, retro design. I love the special marble effect technique, airbrushed with sparkle colours and fine metal flake. It’s a really nice burgundy colour that works really nice with the tan leather pads and lining. The addition of the gold and white really stands out in the design, makes the dark marble effect really stand out more. It’s genuine leather and high-quality fabrics all products and sewn entirely in Italy. As UC said it’s “Everlasting, unchanged over the years and always passes current safety standard, not to mention it’s so comfortable”. The classic jet BELL has been around since 1971 and was made famous by Steve McQueen. It’s a beautiful example of classic design, no point in changing it as it never going to be improved. This particular helmet is part of the special collection, designed for Bike In Black Garage. 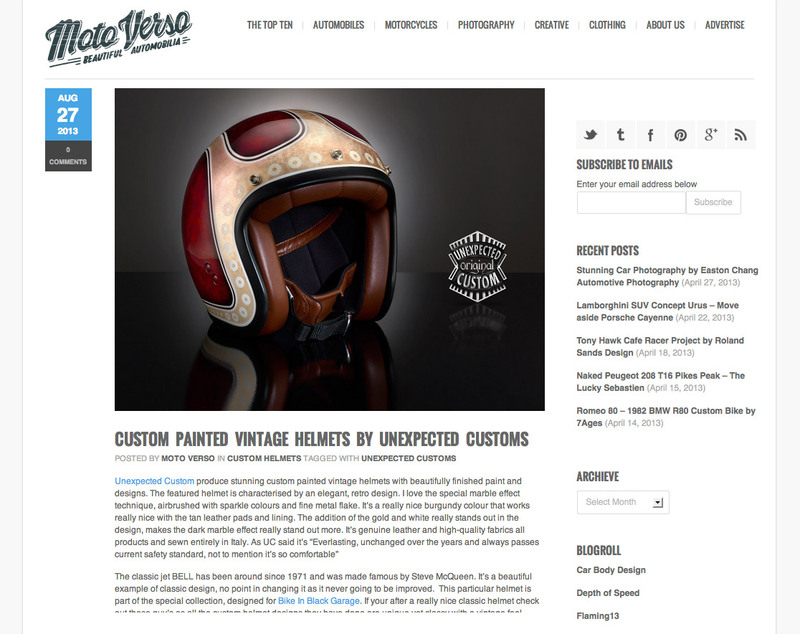 If your after a really nice classic helmet check out these guy’s as all the custom helmet designs they have done are unique yet classy with a vintage feel.